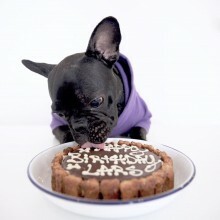 Make your dog's birthday complete with their very own dog birthday cake. Yes that's right, here at Doggielicious we believe there is nothing quite like a sumptuous birthday cake to help celebrate your dog’s birthday. All our dog birthday cakes are made from delicious ingredients, provided, in the main, by organic, ethical producers so we can guarantee the quality. Due to the high demand for our dog birthday cakes please can you let us know the date of your dog's birthday so that we can ensure the cake arrives on time.